In 2004 we went for a late booking. We had booked the week after Easter off and waited to see where there was still good snow, before booking. Via Iglu, I found a chalet in St Anton, Austria and the snow looked promising for so late in the season. Travel was quite convenient - Gatwick-Innsbruck (c. 1.25 hour transfer time to St Anton) on Easter Sunday, leaving at 1PM. It was reasonably, but not overly, warm on arrival at picturesque Innsbruck, but there was plenty of snow visible on mountains on approach and from airport. We passed quickly through the airport and onto the Total Ski coach. A nice bonus on the coach was the news that we would be leaving late enough on the return journey to spend Sunday morning skiing. The trip to St Anton was quick and, although there was not much snow at resort level, there was plenty visible (including on trees) a few 100 metres up the slopes and wide strips of prepared piste made skiing down possible to all areas in St Anton. We got down to the ski hire shop (Jennewein, right by Nasserein lift) and arranged our 11 yr old daughter's skis and boots with little fuss or bother. Food and accommodation, in Nasserein, (formerly the next village along, but now absorbed into St Anton) was perfectly acceptable and the majority of other chalet residents were pleasant company, as were the staff. Most people seemed to have book late. We were up next morning in time to catch (nearly) the first lift (at 8:30).Unfortunately, visibility was quite poor and we were forced down onto lower slopes over St Christoph, a very picturesque mountain hamlet, especially swathed in snow as it was. We ate lunch there (in a restaurant with a slide down to the toilets!) and then skied down blue 12 and 17 (we had Lauren with us) to Stuben, where we skied on a few red runs, before realising we were running a little late (We were at Stuben middle station at 3:30 and the Mattun link lift closed 45 mins later) and rushing back to make the link with just 5 minutes to spare. Next day we all went to ski school. Arlberg ski school is big on technique – Spent much of 3 days working on getting me to use my carving skis properly. Lauren made good progress, too. Visibility was not so good on the first two days and, on the third, warm weather started to make slush a problem on lower slopes, in the afternoon. The Instructors were good at finding the best snow and quietest slopes, although it was generally quiet with nothing resembling a queue to be seen anywhere all week. We took a trip to Zurs/Lech on the 3rd day of ski school. Being a little higher, the snow extended down to the village edge, but was still slushy on the lower slopes by lunchtime. The winter wonderland effect, however, was most impressive, with snow laying around all the buildings. Skiing, generally, is easier in the Lech/Zurs area, with flatter, wider and better groomed slopes prevailing. With the help of the ski instructor, we found lots of good snow in this area and a visit with Lauren later in the week saw us complete the ‘White Circle’ (a circular route taking in Lech and Zurs) in around 3 hours, a very comfortable ski, with little challenging skiing. As we stayed in a Chalet (Chalet Alber) in Nasserein, we did not spend a lot of time in the town, although we did have a very good Pizza in a restaurant on the main road between Nasserein and St Anton proper. It is upstairs in a glass fronted shopping arcade (on the right hand side of the road heading into town from Nasserein, nearly opposite the church) and looks slightly intimidating, but the staff (Italians, mainly) were friendly, the food excellent and the prices more reasonable than the décor suggested. Being late in the season, the Krazy Kanguruh was shut but the Mooserwirt was, reportedly, still alive with people dancing on the tables into the evenings and we enjoyed a wonderful Blutwurstgrustl (Black pudding, potatoes and onions) in the Rodel Alm, which lies on the edge of the Black Fang run back to Nasserein. The portions were generous and there were few English speakers in there, the day we ate, suggesting it gets overlooked, being tucked slightly off the side of the slope and easily missed as you ski down. For the second week of Easter, conditions in St Anton were excellent and our last day (the bonus Sunday morning) was well worth enjoying (although few were doing so) as, above the early morning cloud, the view from the very top of the Valluga was breathtaking – Truly one of those moments when you’re glad to be alive. The runs at the top of the mountain were in wonderful condition, with crisp snow and few people around. Even the, usually busy, decent into St Anton was empty and in good condition and made a wonderful fast decent, down Black 2 and Blue 1, to the Valluga cable car. Overall, it was great to return to Austria after 9 years. It has a mountain atmosphere which no French, Canadian or American resort I’ve visited has come close to and the snow was better than we had any right to expect for the time of year. There were few people around (most Germans heading for the Italian sun for Easter, rather than the Austrian slopes) and St Anton’s changes for the 2001 World Skiing Championships have made it a better resort than it was. Our memories of St Anton from 12 years ago, were of moguled and poorly pisted runs, but this late in the season the runs were mostly carefully groomed and, truth be known, a little tame. Still not a place for beginners, intermediates will enjoy it and, earlier in the season, the abundant opportunities for off-piste skiing will challenge better skiers. If you’re tired of the French treeless slope treadmill or the long haul flights to the US and Canada, ignore the prejudice that Austria has no good skiing and give it another try. For an all-round skiing holiday experience, little can touch it. This was another late booking, looking for somewhere with some snow left at Easter. 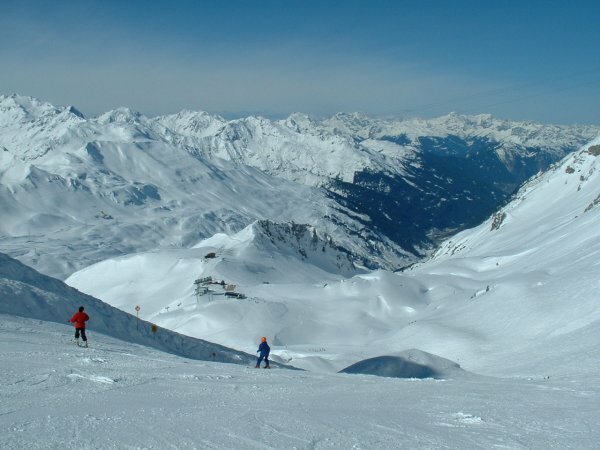 Oddly, we'd never visited the Trois Vallees area in France, despite it being one of the premier ski areas in the world. 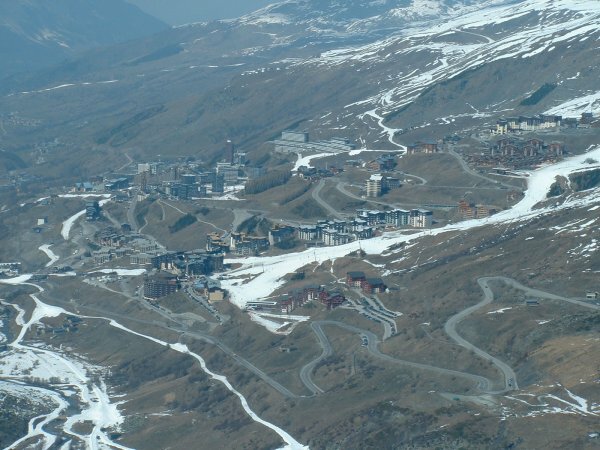 Looking around, I found a small appartment for a very reasonable price through Val Thorens' own website and picked up a cheap flight and transfer to the resort through a package tour company. All in this was a very reasonably priced holiday. We arrived about 9PM and quickly picked up the key to our appartment. It was a small, but clean appartment, but featured the best view I have ever seen from my accomodation. The first 5 days were marked by excellent weather, with lots of sun. This affected the snow conditions in the lower lying parts of the 3 Valleys, but up in Val Thorens (the highest resort in Europe), the snow remained crisp and plentiful. Lauren took in ski school with the ESF and was pleased to be first in her class to attain the 3 stars (this was the last year she was eligible for children's ski school). 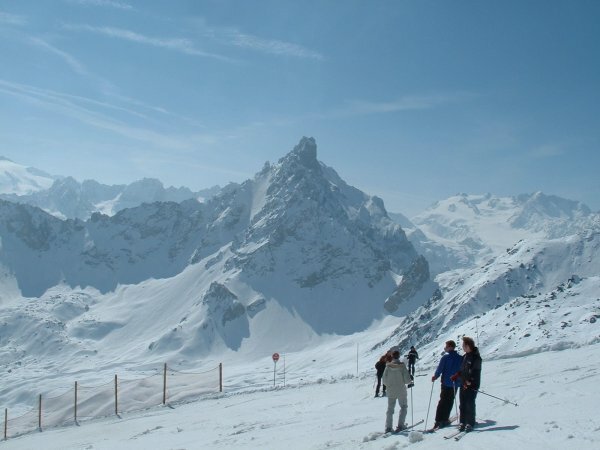 The Trois Vallee (for the few who don't know) is Europe's largest ski area and features resorts such as Courchevel, Meribel, Les Menuires and La Tania, as well as the highest resort, Val Thorens. As long as we stayed high the snow was excellent, staying crisp, although this late in the season there was little fresh snow and off piste conditions were hard and heavy. In lower resorts, the conditions became worse, with large bare expanses off the pistes, although the pisteurs did an admirable job of ensuring that all the resorts (with the possible exception of the very low La Tania) remained accessible on skis. The lift pass was, perhaps expectedly, expensive, but we made use of the full area pass, skiing over to Courchevel as a family one day, although I covered a much wider area on the days I skiied alone. 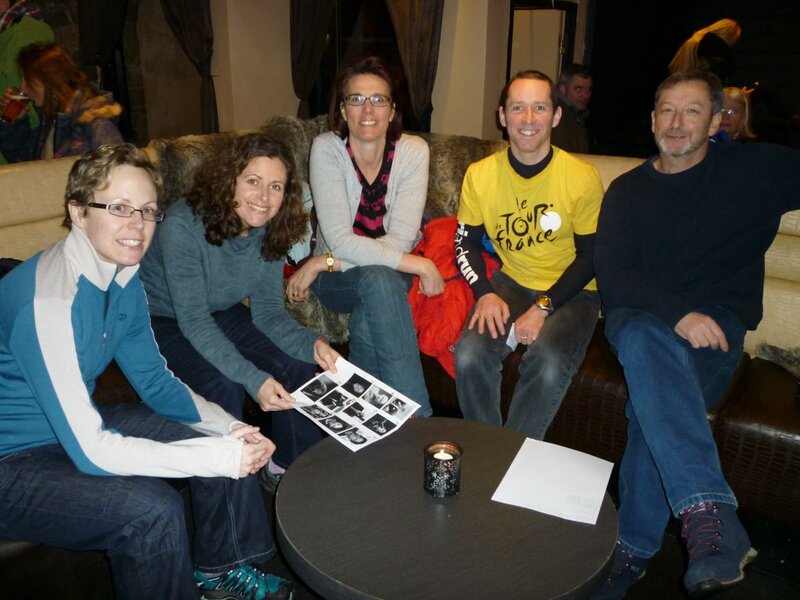 Val Thorens was OK for a purpose built French resort. The buildings are wood or stone and wood mainly and, although modern, not eyesores. There are plenty of restaurants and shops and an extensive sports centre in the centre or the, commendably, compact 'village'. It is also possible, pretty much, to walk from top to bottom of the town without going outside for more than a few metres, thanks to enclosed staircases and walkways. Ironically, on our last day, it started to snow heavily and continued to do so all that night and the following day. Anyone coming skiing in the couple of weeks remaining in the season was likely to be treated to top notch ski conditions on and off piste! 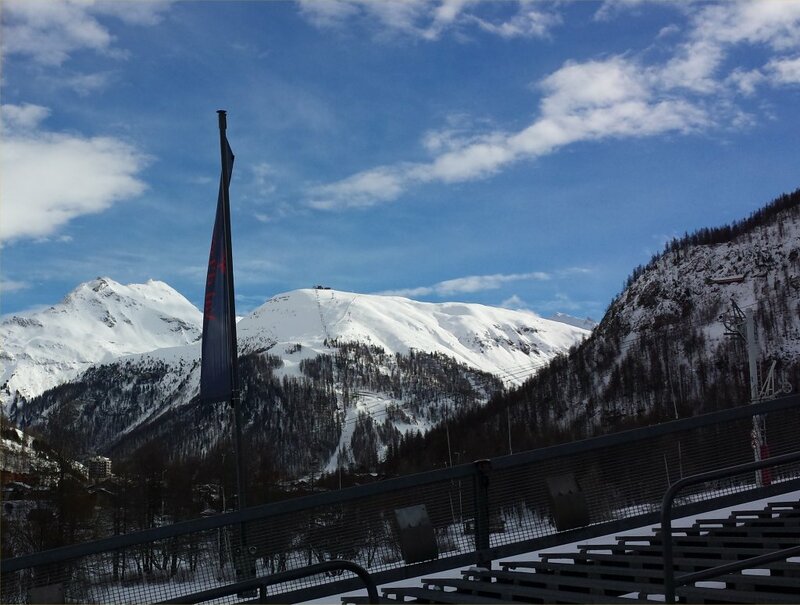 Overall, we were very impressed with the Trois Vallees. There's plenty of skiing and lift queues were never bad at Easter and even where queues did form, you could usually find an alternative lift and set of runs to explore. We will go back sometime, especially if we can do it as cheaply as this! 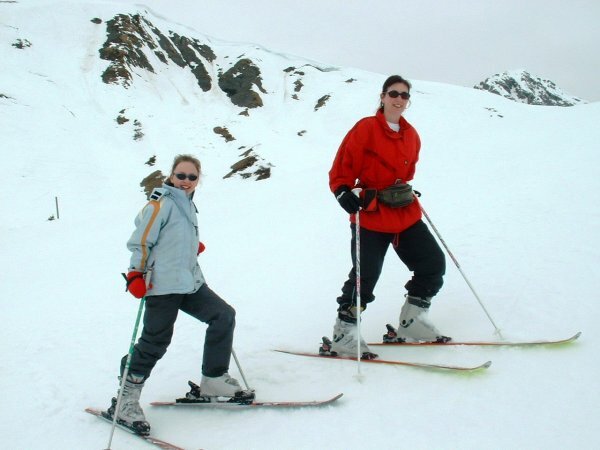 In 2006, we ventured back to the US again for our skiing holiday. Once again, we eschewed the big resorts and decided to take in the wide variety of smaller resorts that New England and Maine offer. Usually snow in February would be plentiful, but 2006 was a freakishly mild winter. That didn't mean, though, that we had a bad time. In 2007, Ryan joined us for the first time. 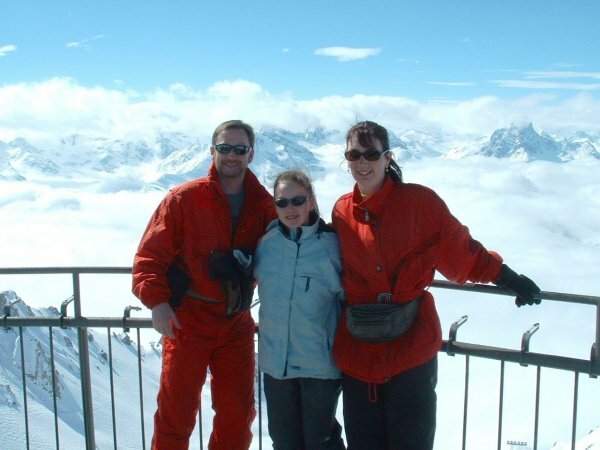 We left it late to book our Easter trip, but decided on a chalet in Alpe D'Huez, a resort Mandy and I had visited for a single day many years ago, whilst staying in Les Deux Alpes. The season had been pretty poor, generally, but we found the late season conditions here very good and you can click here to read the full report. We all went again in 2008, at half term this time. As flights were so expensive, we decided to drive to Avoriaz again (as we'd enjoyed it so much on our previous two visits). 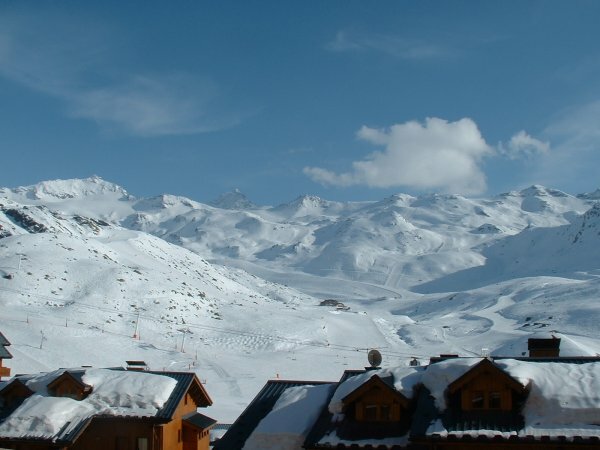 Another late booking took us back to Val Thorens at Easter in 2010. It proved a very eventful holiday! Almost a year to the day after breaking my leg, we were back at the scene of the accident. Was I really up to it or was it a total disaster...? 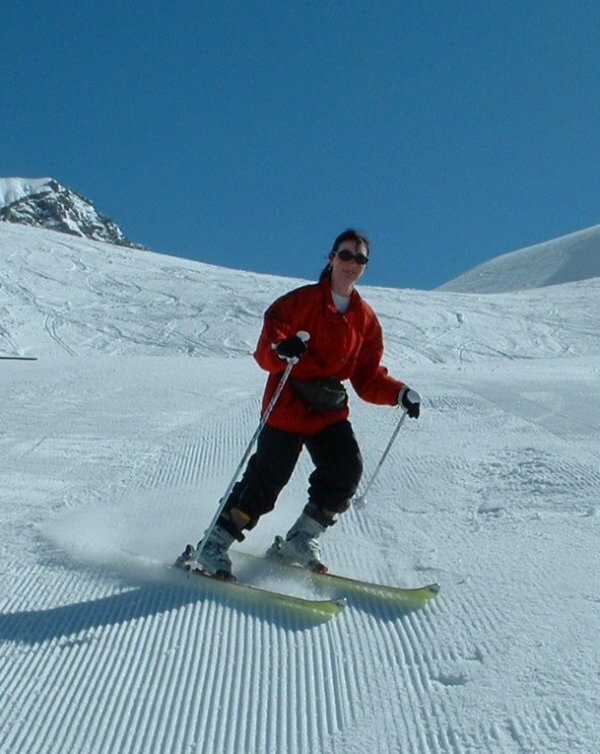 2011 had, for me at least, been a bit of a tentative return to skiing, but in 2012, I was, if anything, fitter than for years, thanks to all that physio and gym visits to build up my knee. Neither of the kids wanted to come with us (well, Lauren did, but as she'd chucked in her job and booked an expensive summer holiday, I decided it was time to stop funding her skiing! ), so Mandy and I opted for a week in Val D'Isere in January (thanks to some kind friends who looked after Ryan for the week). 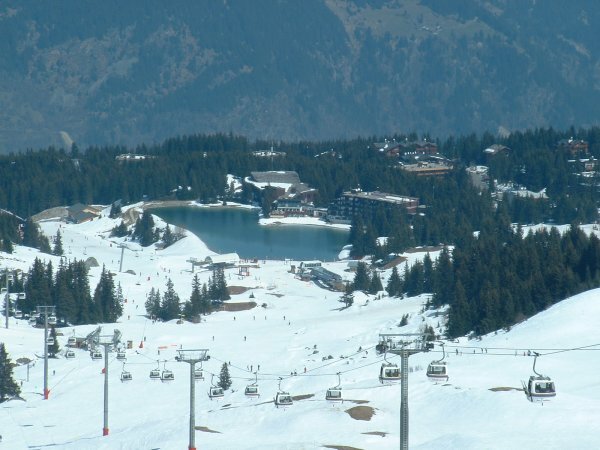 In 2013, it was just the two of us again and, after a bit of an expensive few months, we settled on a cheap chalet deal in La Plagne, a resort we'd never visited before. You can read what we thought here. In 2014, I got to ski a bit of dream location, Wengen. Well known for its trains and the longest and fastest Downhill course in the world, the Lauberhorn, it certainly turned out to be a unique experience. 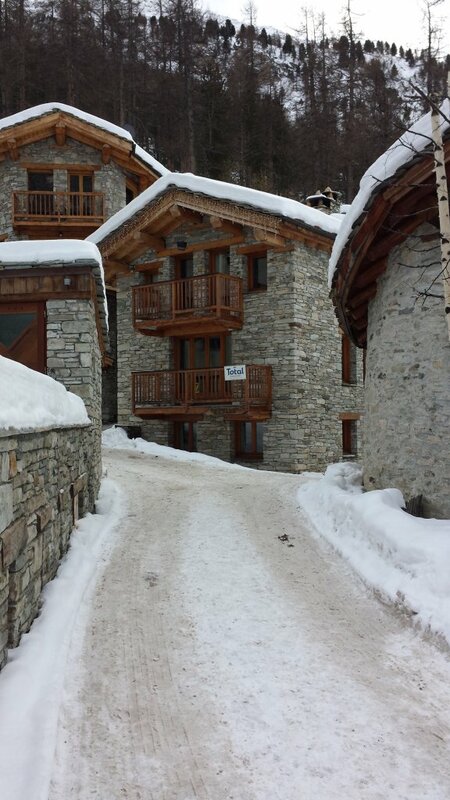 Unusually for us, we booked a chalet in Val D'Isere in the previous summer. 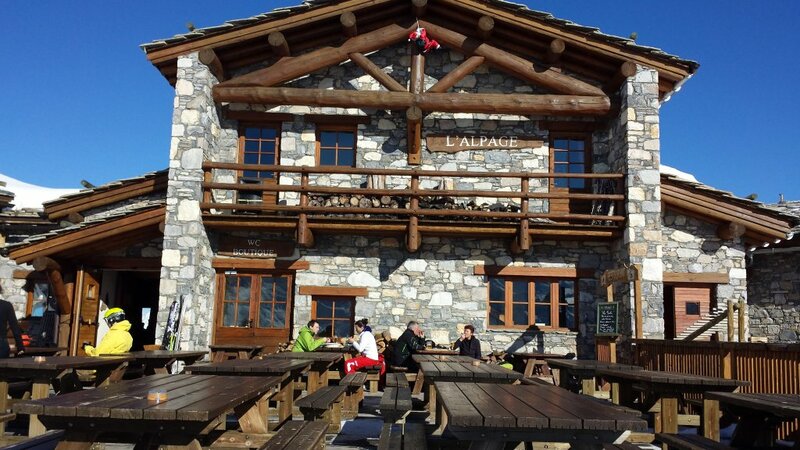 The chalet was in Fornet, which has a cable car to access the ski area. There was a bit of a stroll up to the lift each morning and we only bothered skiing back down one day as the Red and Black were closed due to thin snow cover. Overall, we had another good holiday in Val D'Isere, but we wouldn't stay in Fornet again, although the Chalet (Bonnevie), Host and fellow guests were all very good. We got on well and all ate out together on the host's night off, in the L'Arollay restaurant in Fornet, which served up excellent regional Savoie fare. Snow wasn't as plentiful as on our previous visit, but there was enough on piste not to be an issue and the weather was much better than predicted with at least 50% of the time being sunny. 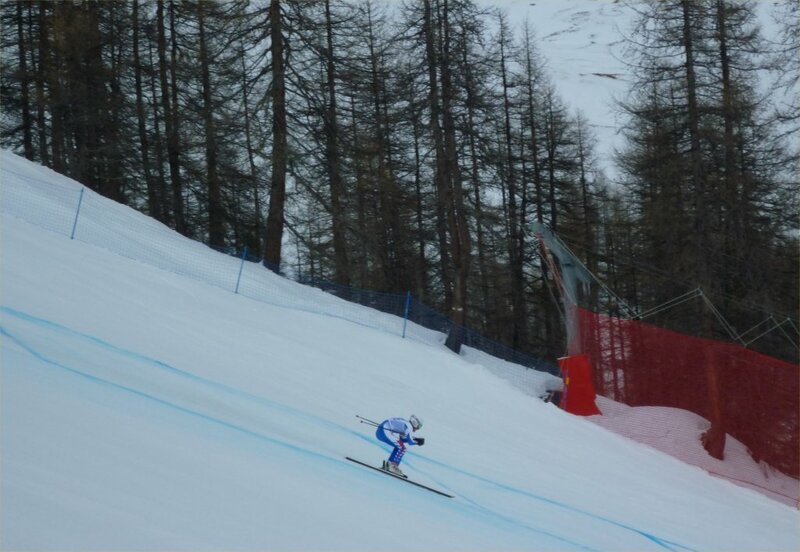 While we were there, the Europa Cup circuit was in town and we saw some of the future ski-champions in action. 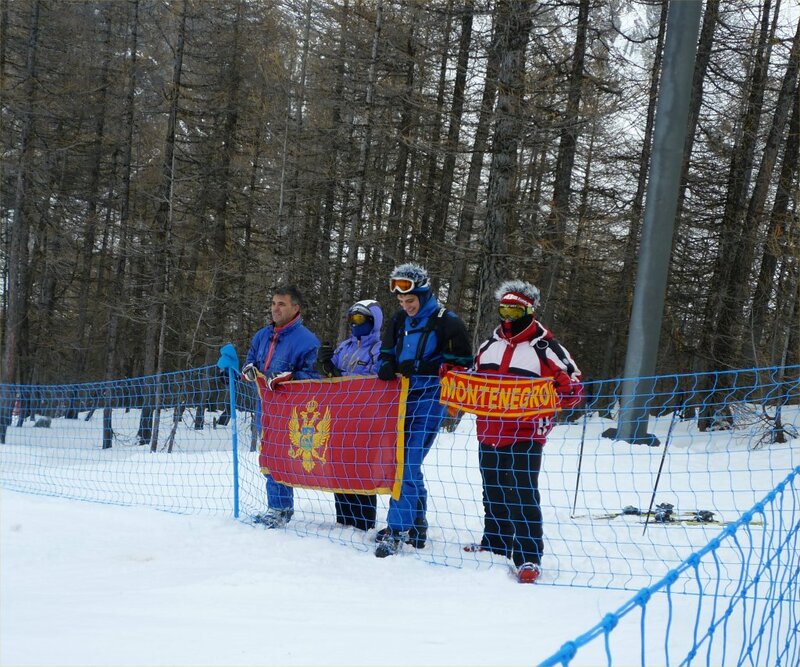 Some racers even brough their own fanbase! In 2016, we finally got to visit Zermatt, which Mandy had suggested visiting many times over the years. It would prove to be a memorable trip, but for the wrong kind of reason! After the eventful Zermatt, it looked like neither of us may ever ski again, but in the end Lauren and I set off for a long weekend to Garmisch-Partenkirchen in Bavaria in 2017. We often visited Garmisch in the 1990s, so it was with interested that we ventured back. You can read what we found here.